It’s around that time for us at SOTA, the curious period of time after winter break when us students are caught in a dry spell as to three-day weekends. Some of us have started to lament the numerous AP classes and tutoring sessions we signed on for, and classes have really kicked in, for the juniors especially. This is the time when grades really do matter, even more than before. Along with this pressure, we’ve begun to tentatively attend college fairs, sign up for testing sessions, and taken the first steps to the college search at large. It’s equal parts daunting and exciting, the first taste of a soon-to-be-real future and a world of opportunity. This new reality has prompted excited discussion in the junior class about our ambitions and plans for the future. We talk a lot about where in particular we’d like to pursue our higher education. Many of us feel like staying in California would be too close to home, and some say the same about neighboring states like Oregon. Similarly, some kids worry about going to school in New York or the northeastern region in general, but still feel obligated to pursue schooling there- isn’t that too far? How will I live on my own? The financial burden of going to school out-of-state- and so far away- weighs heavy. So why not compromise, I ask? There’s a whole United States between just the coasts. Although it might not be the best idea to set your sights on Kansas State, there are plenty of reputable Southwestern and Southern schools of every variety to consider, as well as hundreds of outstanding Midwestern institutions. My peers and family members alike dismiss this. The widespread belief seems to be that you have a choice between Californian state colleges and over expensive liberal arts schools in Connecticut. Aren’t those places you mentioned all racist and backwards? Do you really want to be somewhere where you have to drive? Why go to school outside of a city? These are some of the questions posed by my fellow students in addition to, well, every San Franciscan who knows I’ll begin the application process soon. There is a strange current of exclusionism that dominates our city. I reject the idea that the coasts are the only “worthwhile” places to pursue an education or establish oneself as an artist and community member. That’s ridiculous and robs us liberal-bubble-livers of whole worlds of opportunity- worlds that may include (gasp!) views that differ from ours. Of course, I understand that there’s reasons for universities being where they are. Coastal cities have historically been places of exchange. Many universities are located where the colonies were first established, and so are much older, prestigious, and well-respected than those dotting the rural United States and Western regions. There are exponentially more artistic and intellectual opportunities in a city like New York City than in, say, Charleston or Santa Fe or Birmingham, that much is obvious. In November of last year I spent several days in the great town of Nashville. Although awash with a strange capitalist music scene, and chock full of drunken bachelorette party attendees, the city has my heart in a way that few places do. I know that many creative writers, after taking a whirlwind tour of New Orleans, feel the same about that city. The point is that there’s no reason to reject something or somewhere just because of the way you think you’re supposed to feel about it. I’m sure that many people reading this post will be nervous parents unsure of sending their child to an arts high school, and will be leaning toward more academic institutions like Lowell High School. If you remember that you have more options than you think, and are never stuck, you might just find your Nashville! “Make America Great Again!TM” is an newer rendering of Ronald Reagan’s 1980 campaign slogan, “Let’s Make America Great Again,” and was Donald Trump’s successful campaign slogan in 2016. Trump patented the phrase, so it technically bears a trademark. It has appeared on campaign posters, shirts, buttons, and most notably the iconic red trucker cap. The phrase has been repurposed for the sake of parody and satire, such as on political commentator John Oliver’s television show (“Make Donald Drumpf Again”). Activist movements and individuals have coined the phrases “Make America Think Again,” “Make America Gay Again,” and “America Was Never Great.” Donald Trump created a distinguished popular culture phenomenon by using hubris, nostalgia, and populist diction to raise the collective spirit of millions. First and foremost, Trump uses hubris to create an impression of American dominance the world economy and political scene. The definition of hubris is “excessive pride or self-confidence.” Trump’s slogan contrasts that of Former President Obama’s campaign slogans “Hope,” “Yes We Can,” and “Change We Can Believe In” as well as Former President George W. Bush’s “Yes, America Can,” and “Moving America Forward.” Trump’s slogan is distinctive in that it lacks the ideas of change and forward movement, concepts that are central to most normal campaigns. Rather than suggest positive, modernist change, Trump is suggesting that America’s greatness lies in what it used to be, and that is what made him such a distinctive candidate. This idea of America having been “great” in the past reflects a certain amount of hubris on Trump’s part. Trump has pride in what his country used to be. He holds confidence in the perfection of Reagan’s trickle-down America and also believes that he is the only candidate that can achieve that sort of utopia. All candidates, regardless of ideology, have to hold themselves in some sort of high esteem in order to consider themselves worthy of office. Most, however, try to communicate a certain amount of humility in order to identify with the general public. Barack Obama, for instance, in using the slogan “Change,” bluntly admitted that America was flawed and had room to grow in many areas. He suggested himself as the best candidate to achieve that sort of growth but never acted like America had ever been perfect. George W. Bush was less humble in his use of “Moving America Forward” but still acknowledged that America could improve in a few respects. Trump, on the other hand, uses hubris by blatantly not admitting America’s problems, both past and present, instead promising to return the country to its former utopian state. The phrase also demonstrates Trump’s idealist notion that America should be the utmost dominant world power and deserves to be the ultimate decider of geopolitics, trade deals, and social change (or lack thereof). Another vital device that Trump utilizes is populist diction. Each word in the phrase “Make America Great Again” appeals to those who feel as though America used to be great, has somehow wronged them in its lack of “greatness,” and is the only country that can and deserves to be so. The word “make” communicates assertiveness and duty. The message of the phrase is not up for debate- “make” demonstrates that Trump’s supporters are ready to change their America by any means necessary. It is a call to action, an obvious assertion that something has to be done, and now. That call to action points towards the most obvious course of action, which is electing Trump. The next two words “Great Again” especially attract working class whites who believe that their “greatness” has been stolen by immigrants and refugees. The idea of America having to be “great” entices patriots who believe in “America first” values-people who don’t believe in a global, symbiotic economy, but rather in one that involves America mostly exporting and not importing, an economy in which America reaps most of the benefits. Lastly, Donald Trump utilizes a tone of nostalgia. He has been cited to point to the “late ’40s and ’50s,” during which “we were not pushed around, we were respected by everybody, we had just won a war, we were pretty much doing what we had to do,” as America’s golden age. Trump, in saying “Make America Great Again!” is both admitting that America is currently in decline and proposing that he is the only candidate who can turn things around. Trump has raised controversy in believing that the ‘40s and ‘50s were a great time-while the economy was thriving, women and people of color were still being denied their basic human needs and rights as citizens. Trump champions the working white man. He plays on working class people’s ever-present insecurities and appeals to their sense of nostalgia. Most Trump supporters are working class whites who wonder why they work so hard and never achieve the American Dream promised to them. They wish to return to the Golden Age of their parents’ and grandparents’ lives, a time when the laboring white person was applauded for just being such; when people of color and working women hadn’t yet infiltrated their predetermined social strata. Trump plays on these insecurities, these “us versus them” ideals, by using the word “again” to connote an American golden age of white male supremacy. The first time I heard David Bowie was when I was nine years old. I had been hearing him all my life—my father was and is an adamant fan, and so Bowie’s music was always around—but it was at the age of nine when I actually heard him. Before that moment, I had been going through musical “phases”—first it was Michael Jackson, then Queen, then Prince (I always have loved the glam ones). At first Bowie’s music left a figurative bad taste in my mouth. It was scary, nonlinear, unforgiving. Other than “Space Oddity” and the occasional “Life on Mars” or “Modern Love,” Bowie’s music was mostly absent from radio set lists. Then I discovered my dad’s records. I started with his 1977 release of Heroes and later progressed to Hunky Dory and Aladdin Sane. More recently, I’ve been listening to the back tracks of Low, Lodger, and The Man Who Sold the World. The thing that has resonated with me in his music is not the startling harmonies, outbreaks of brassy saxophone, or twanging guitar leads. It’s not in the in-your-face, often sexual songwriting, or in the promiscuous and gender-ambiguous manner in which he used to dress. The thing that I love about this man is his ability to change personas, to change himself, at the drop of a metaphorical hat—without ever looking back. This is the type of person that I aspire to be. David Bowie released his last album on his birthday, three days before his death. His album, Blackstar, was in a way a parting gift to his fans. It is moving to think that he considered the lives of people he has inspired rather than his own. I was angry when I heard of David Bowie’s death. I was frustrated, and I was in denial. I though that, if anyone should have immortality, it should be a man who changed millions of lives! He had made me realize that I could be as brave as him, as forthcoming. He made it okay to be a “freak.” He was a hero to me for years and years (pardon the expression, Bowie fans). The thing I wish for myself, as both a writer, and a musician, and human being, is to be somebody’s hero like he was for me. About a week or two ago, Heather told the entirety of Creative Writing that she needed rocks for a demonstration in one of her English classes. We were to sneak into a closed-off construction site near the theater and get some after school let out. About half of the department—including Ren (’19) and I—set ourselves upon doing this. We were about halfway to the theater when we spotted a huge hunk of cement that was being used as a doorstop by the cafeteria. Without another thought, I grabbed the rock and proceeded to lug it back up to the CW room. It must have weighed twenty pounds. Heather was surprised when we brought it in—it turned out she had wanted stones, not rocks, for her demonstration. She dubbed it the Freshman Rock and I foolishly agreed to spray paint it yellow in time for Field Day. A few minutes later, six or so Creative Writers staggered in with an IKEA tote bag full of head-sized rocks and Heather had to re-explain her mistake. It took a lot of effort to get The Rock home. Kayne (’18) helped us out by lugging the rock up three flights of stairs. 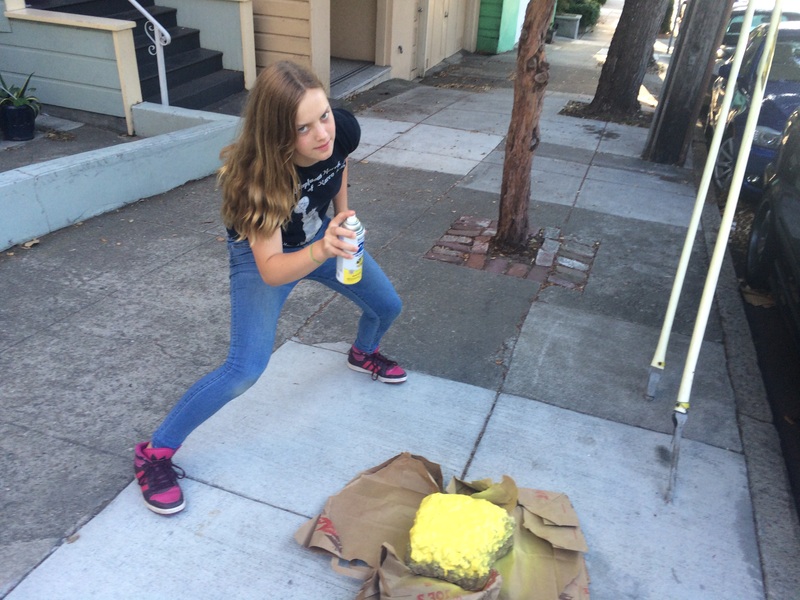 We then had to take it on the 44, where we were yelled at by a MUNI officer about our “art project.” By the time Thalia (’18) and I had gotten to my house, both of our laps were covered and dust and we had accumulated more than a lifetime’s worth of dirty looks. On The Wednesday before Field Day, I realized that I was lacking the obnoxiously yellow paint needed to adorn The Rock and enlisted my dear mother to buy some—you have to be 18 to get spray paint. It took a little bit of doing, and a lot of blow-drying, but the rock was painted and dried in time for Field Day. It now resides on top of a bookshelf in the CW room. Now, our only obstacle is getting Isaiah (bless his heart) to approve the new, glaringly yellow member of the CW family even if it doesn’t comply with his aesthetic sensibilities.